Below is our Model 284 consensus bracket for the 2018 tournament. As you will see from our Round 1 Predictions and tournament simulation results, we do not necessarily pick the model’s predicted winner for every single game, but rather using our predictions weighed against popular public picks and focusing on our numbers for which teams are most likely to make it out of each region / sub-region. 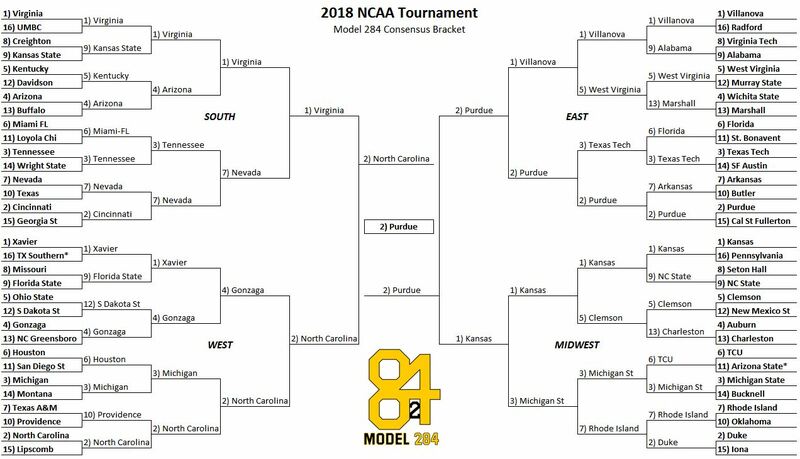 If you want to hear more on what our model’s predictions, we discussed the bracket in detail on this week’s episode of the Model 284 podcast.